1x 48 Port Cat6 Patch Panel. 1x Brush Cable Tidy Bar. Brush Cable Tidy Bar. This bundle includes The Comlynx Patch Panel range is designed to allow patching of voice, ISDN and high-speed data signals within Cat 6 structured cabling systems. P/N: 03859. SKU: 03859. MPN: 03859. Manufacturer: C2G. Each panel has cutouts that accept virtually all snap-in jacks, making the panels perfect for ethernet, voice, audio/video, and/or other applications.The clear numbering on the front gives you a quick and easy way to identify cable runs. 1x 48 Port Cat6 Patch Panel. The Comlynx Patch Panel range is designed to allow patching of voice, ISDN and high-speed data signals within Cat 6 structured cabling systems. They are available in 16, 24 and 48 way, 1U and 2U versions. 1x Brush Cable Tidy Bar. Brush Cable Tidy Bar. 1x 16 Port Cat5e Patch Panel. Brush Aperture Tidy Bar Specifications This bundle includes The Comlynx Patch Panel range is designed to allow patching of voice, ISDN and high-speed data signals within Cat 5e structured cabling systems. 1x 24 Port Cat5e Patch Panel. The Comlynx Patch Panel range is designed to allow patching of voice, ISDN and high-speed data signals within Cat 5e structured cabling systems. This bundle includes. Conforming to IEC 60320 our C14 (IEC) units have been designed specifically for 19” cabinet use. 3M UK Mains Lead. Mains Plug: Plastic Protector Fitted. More Power Distribution Units. Earth Connection: Single Point, Internal. 1x Ring Cable Tidy Bar. Brush Cable Tidy Bar. 1x 16 Port Cat5e Patch Panel. Jumper Ring Tidy Bar Specifications The Comlynx Patch Panel range is designed to allow patching of voice, ISDN and high-speed data signals within Cat 5e structured cabling systems. 1x 48 Port Cat6 Patch Panel. 1x Ring Cable Tidy Bar. Brush Cable Tidy Bar. The Comlynx Patch Panel range is designed to allow patching of voice, ISDN and high-speed data signals within Cat 6 structured cabling systems. 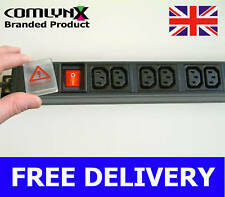 Adjustable Front and Rear Profiles to enable eg rear mounting of PDU if required. Bundle Deals! Rack Specification:19" Data Rack. Main Colour:Ivory White. Patch Panels (C5e & C6). They are designed to house standard 19" Rack mount devices. The Comlynx Patch Panel range is designed to allow patching of voice, ISDN and high-speed data signals within Cat 6 structured cabling systems. They are available in 16, 24 and 48 way, 1U and 2U versions. P/N: 03857. SKU: 03857. MPN: 03857. Manufacturer: C2G. Each panel has cutouts that accept virtually all snap-in jacks, making the panels perfect for ethernet, voice, audio/video, and/or other applications.The clear numbering on the front gives you a quick and easy way to identify cable runs. 1x Ring Cable Tidy Bar. Brush Cable Tidy Bar. 1x 24 Port Cat5e Patch Panel. Jumper Ring Tidy Bar Specifications The Comlynx Patch Panel range is designed to allow patching of voice, ISDN and high-speed data signals within Cat 5e structured cabling systems. 1x 48 Port Cat5e Patch Panel. The Comlynx Patch Panel range is designed to allow patching of voice, ISDN and high-speed data signals within Cat 5e structured cabling systems. This bundle includes. 1x Brush Cable Tidy Bar. Brush Cable Tidy Bar. 1x 24 Port Cat5e Patch Panel. Brush Aperture Tidy Bar Specifications This bundle includes The Comlynx Patch Panel range is designed to allow patching of voice, ISDN and high-speed data signals within Cat 5e structured cabling systems. 1x Brush Cable Tidy Bar. Brush Cable Tidy Bar. 1x 48 Port Cat5e Patch Panel. Brush Aperture Tidy Bar Specifications This bundle includes The Comlynx Patch Panel range is designed to allow patching of voice, ISDN and high-speed data signals within Cat 5e structured cabling systems. 1x Ring Cable Tidy Bar. Brush Cable Tidy Bar. 1x 48 Port Cat5e Patch Panel. Jumper Ring Tidy Bar Specifications The Comlynx Patch Panel range is designed to allow patching of voice, ISDN and high-speed data signals within Cat 5e structured cabling systems. 1x 24 Port Cat6 Patch Panel. The Comlynx Patch Panel range is designed to allow patching of voice, ISDN and high-speed data signals within Cat 6 structured cabling systems. They are available in 16, 24 and 48 way, 1U and 2U versions. 1x 24 Port Cat6 Patch Panel. 1x Ring Cable Tidy Bar. Brush Cable Tidy Bar. The Comlynx Patch Panel range is designed to allow patching of voice, ISDN and high-speed data signals within Cat 6 structured cabling systems. 1x 16 Port Cat5e Patch Panel. The Comlynx Patch Panel range is designed to allow patching of voice, ISDN and high-speed data signals within Cat 5e structured cabling systems. This bundle includes. 6U Grey 450mm Data Network Cabinet Wall Mount Kit. Adjustable Front and Rear Profiles to enable eg rear mounting of PDU if required. Our grey 450mm cabinets are designed to combine a neat appearance with convenience and functionality. Adjustable Front and Rear Profiles to enable eg rear mounting of PDU if required. Cabinet Bundles They are designed to house standard Patch Cords, 19" Patch Panels or Power Distribution Units (PDUs). The Comlynx Brush Tidy Bar is used within a 19” rack. Rack Specification:19" Data Rack. Gross Weight:306g. Category 5 Patch Panels. Coating:Powder Coat. Rack Units Used:1U. Main Colour:Black. Front Cable Manager. Adjustable Front and Rear Profiles to enable eg rear mounting of PDU if required. They are designed to house standard Patch Cords, 19" Patch Panels or Power Distribution Units (PDUs). Cabinet Bundles. Rack Specification:10" SOHO Rack. They are designed to house standard Patch Cords, 10" Patch Panels or Power Distribution Units (PDUs) and various 10" rack mounted accessories. Main Colour:Office Grey. They are designed to house standard 19" Rack mount devices. Rack Specification:19" Data Rack. Gross Weight:13kg. The appearance of the cabinet may differ slightly from the image used. Rack Capacity:6U. Adjustable Front and Rear Profiles to enable eg rear mounting of PDU if required. Our slimline wall-mounted data cabinets are designed to combine a neat, non-intrusive appearance with convenience and functionality. Port Presentation:RJ45 Socket. The Comlynx Patch Panel range is designed to allow patching of voice, ISDN and high-speed data signals within Cat 5e structured cabling systems. Brush Cable Tidy Bar. 1x Black 6U Slimline wall cabinet. 10" 6U 300mm Black Network Cabinet 1x Brush Cable Tidy Bar. Bundle deals! 1x 12 Port Cat 5e Patch Panel. Rack Specification:10" SOHO Rack. Patch Panels (C5e & C6). Cat6 RJ45 Patch Panel 24 Port 19” UTP Ethernet Network With Rear Manager Bar. The Comlynx Patch Panel range is designed to allow patching of voice, ISDN and high-speed data signals within Cat 6 structured cabling systems. Rack Specification:10" SOHO Rack. They are designed to house standard Patch Cords, 10" Patch Panels or Power Distribution Units (PDUs) and various 10" rack mounted accessories. Main Colour:Ivory White. Adjustable Front and Rear Profiles to enable eg rear mounting of PDU if required. They are designed to house standard Patch Cords, 19" Patch Panels or Power Distribution Units (PDUs). Rack Specification:19" Data Rack. 6U Office Grey 300mm Data Network Cabinet Wall Mount Kit. Adjustable Front and Rear Profiles to enable eg rear mounting of PDU if required. The appearance of the cabinet may differ slightly from the image used. They are designed to house standard 19" Rack mount devices. Bundle Deals! Rack Specification:19" Data Rack. Gross Weight:16kg. The appearance of the cabinet may differ slightly from the image used.